The major difference between sea salt and table salt is that sea salt is collected in vast trays from the ocean. The water that is caught in these trays is dried by the sun, and what is left after the water evaporates is totally unrefined sea salt. Most of the time, it is minimally processed. This minimal processing leaves a lot of the natural trace mineral intact, which also reduces the actual sodium content. Some people are concerned about sea salt because it does not contain iodine. Table salt added this necessary nutrient several decades ago when a significant part of the population began developing goiters due to an iodine deficiency. Nowadays, this is not really a concern. There are some sea salts that do contain iodine. Iodine is actually found in small trace amounts naturally in sea salt, as it is in most seafood, so you are still getting iodine in its natural, untouched form. And as long as you eat a balanced, healthy diet, then you have nothing to worry about. The differences between refined salt (also known as “table salt”) and unrefined natural sea salt are huge. Major table salt producing companies mine unpalatable rock salt from the earth, then dry it in huge, fossil-fuel-guzzling kilns with temperatures reaching 1200 degrees F. This changes the salt’s chemical structure into pure sodium chloride, an unnatural chemical form of salt that your body recognizes as a foreign substance and wants to get rid of it as quickly as possible. In order to eliminate the invader, water molecules surround the sodium chloride to neutralize it by breaking it into sodium and chloride ions. For this process, water is extracted from our cells, which then can dehydrate and die. This neutralization process not only kills cells, but also takes a tremendous amount of energy, and causes a constant overburden on our excretory organs. But if that weren’t enough, after this extremely energy-intensive drying process, toxins like fluoride, anti-caking agents, excessive amounts of potassium iodide and other poisons are mixed into the salt. Many versions of commercial salt also contain toxic aluminum derivatives, which have been implicated in a number of health conditions, including Alzheimer’s disease. Bleaching agents are also added to bring out the desirable white color. Sea salt is better than table salt, by a wide margin. In contrast to refined table salt, most sea salt is naturally harvested and dried in the sun, and contains a wealth of trace minerals and electrolytes that are easily assimilated by your body. Unlike refined salt which contains only 2 or 3 elements, sea salt contains about 80 mineral elements (potassium, magnesium, calcium, sodium and more) that are essential in small amounts for a variety of functions in the body. These mineral salts and electrolytes are key players in enzyme production as well as immune system, adrenal and thyroid function. Stabilizes irregular heartbeats and, contrary to the misconception that it causes high blood pressure, it is actually essential for the regulation of blood pressure—in conjunction with water. It is important to not consume it excessively. Extracts excess acidity from the cells in the body, particularly the brain cells. Balances the sugar levels in the blood. Generates hydroelectric energy in cells in the body. Absorbs food particles through the intestinal tract. Clears the lungs of mucus plugs and sticky phlegm, particularly in asthma and cystic fibrosis. Clears up congestion of the sinuses. Prevents excess saliva production to the point that it flows out of the mouth during sleep. Makes the structure of bones firm. Osteoporosis partly due to a result of salt and water shortage in the body. Regulates sleep. It is a natural hypnotic. Salt on the tongue will stop persistent dry coughs. Prevents gout and gouty arthritis. Prevents varicose veins and spider veins on the legs and thighs. Vital to the communication and information processing of nerve cells the entire time that the brain cells work—from the moment of conception to death. The balanced sodium, potassium and magnesium in natural, unrefined sea salt can help to regulate fluid balance in the body and allow nutrients and oxygen to travel to their necessary destinations. Unlike refined table salt, which takes water from your cells, natural sea salt allows the body to achieve a balance of water in your body, both inside and outside your cells. 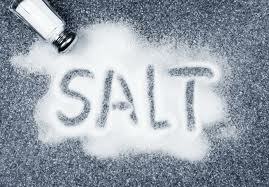 With adequate natural salt and pure water, conditions like gout, muscle cramps, water retention and edema disappear. Balanced natural salts help regulate healthy blood pressure. Natural salt has also been shown to be very helpful in treating adrenal fatigue and chronic fatigue syndrome where blood pressure issues are common. 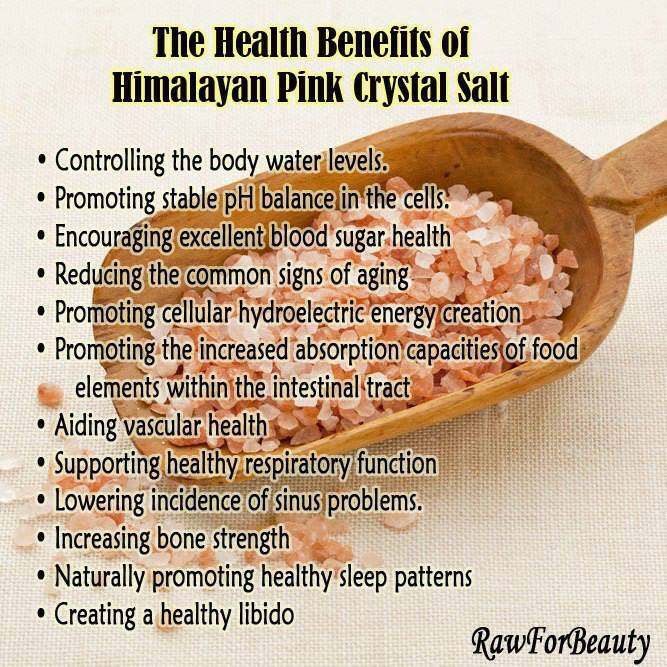 Another benefit of natural salt is that it stimulates the production of hydrochloric acid in the stomach and digestive enzymes in the mouth and intestines, which are necessary for the body to utilize nutrients from the foods we eat. Natural sea salt can help the body digest these foods properly. Sea salt has been used as a primary medicine for thousands of years. Sea salt can help relieve asthma by putting a small amount on the tongue and letting it dissolve after drinking a large glass of water. There are asthma inhalers now that use salt solution only it works well. Salt is also essential for nerve conduction and preserving melatonin and serotonin levels in the brain too, so it helps with a variety of emotional disorders such as high stress tendencies, anxiety, and depression. Natural sea salts have the ability to clean out the acidity in the brain, which is very helpful with Alzheimer’s. Natural sea salts are also vital for maintaining muscle tone and strength throughout the body. For example, ongoing low salt intake can affect bladder control in those who have urinary incontinence, and can slow down peristalsis (muscular contractions) in your intestines, leading to sluggish digestion. Refined sodium chloride is added to almost every preserved, packaged and processed product that you eat. Unless you read every package label, it’s very easy to get too much of this industrial chemical and throw your body out of balance. To avoid refined table salt and its toxic additives, avoid processed foods as much as possible, and be careful to check the labels of the other foods you buy. Even fresh meats are often packaged in broths made with refined salt. To avoid the refined salt at restaurants, you can carry packets of sea salt in your purse or wallet. If you have adrenal fatigue or chronic fatigue syndrome, you should carry sea salt with you everywhere. This entry was posted in Salt. Bookmark the permalink.